Headwig by Steiff. 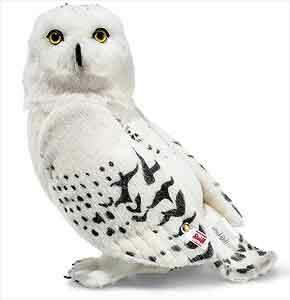 This beautiful interpretation of Hedwig Owl from the Harry Potter film is hand made, in white mohair and wears the white ear tag, signifying this item as a Steiff limited edition, together with the famous gold plated Button in Ear. Limited edition of only 1500 pieces worldwide. Product details: jointed, safety eyes, synthetic filling material, non growler, size 30cm. Comes boxed, together with a numbered certificate of authenticity.